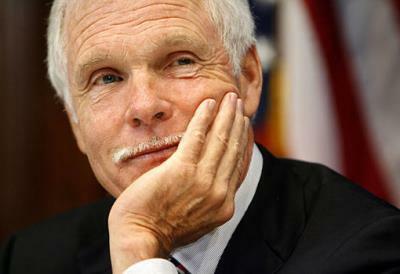 Media mogul Ted Turner has a much larger influence on your life than you probably realize. Per A.C. Nielsen Co. (Nielsen Ratings) the average American watches slightly over 5 hours of TV per day. That equates to 9 years of the average American life spent watching TV. This is just SOME of the TV stations Turner owns, there are MANY more, this also does not include the hundreds websites, radio stations and print media he owns. 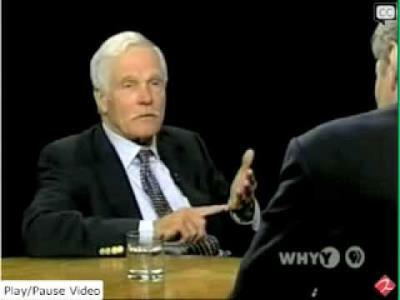 When someone has this much influence and control of mass media that billions of people worldwide watch, is it not wise to analyze the disturbing things this person is bold enough to publicly say? In every business the end product has the approval of the owner, as do the people he employs to run his businesses. 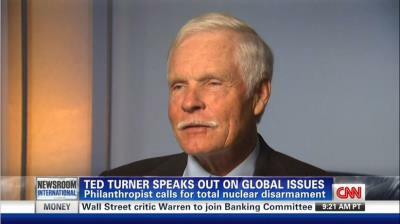 It is safe to say CNN is not broadcasting anything Ted Turner does not like, thus it is also safe to say CNN is broadcasting Ted Turner's AGENDA. To imagine anything otherwise is pure naivety. What is Ted Turners agenda then? Firstly he is an admitted atheist so throw out any positive spin on religion in Turner programming and insert religious antagonism and moral corruption. He was quoted calling people who believe in Ash Wednesday "Jesus Freaks". He is also an admitted Eugenicist. 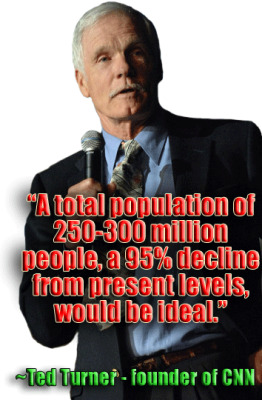 He believes that the world is too populated and we need to get rid of a several billion people, genocide anyone? Where else do we hear this language? - His New World Order cronies. In the USA all of the media is owned by only 6 companies, radio, TV and print. The agenda of the other 5 are no different from Ted Turners. They are unison in their agenda of global control and manipulation and they are programming it to you daily, indoctrinating you and manipulating your thoughts. Telling you what to buy, who to like and who to vote for and what to consume. Do yourself a favor and research Agenda 21. No, you won't see it on CNN, wonder why?